Woodward-Fieser rules work well for conjugated dienes and polyenes with upto 4-double bonds or less. Certain plant pigments such as carotenoids have even more than 4 conjugated double bonds. 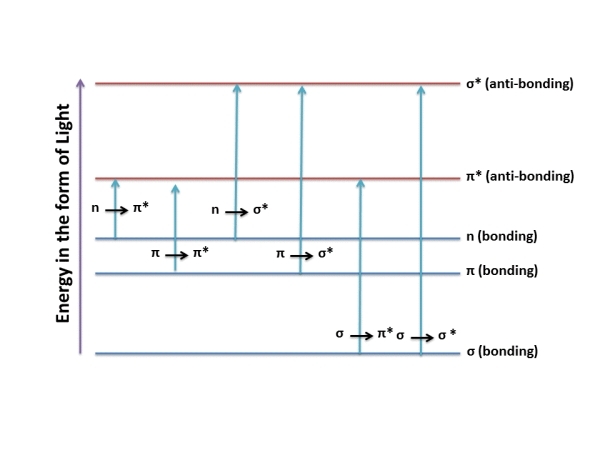 For conjugated polyenes having more than 4 double bonds, the Fieser-Kuhn rules must be applied in order to obtain the wavelength of maximum absorption. Rexo is the number of rings with exocyclic double bonds in the conjugated system. n is the number of conjugated double bonds. β-carotene is a precursor of vitamin A which is a terpenoid derived from several isoprene units. The observed λmax of β-carotene is 452 nm, while the observed εmax is 15.2 x 104. Let us therefore use Fieser-Kuhn rules to calculate the λmax and the εmax for β-carotene. Lycophene (all-trans-lycophene) is a bright red carotenoid pigment found in tomatoes and other red fruits and vegetables. However, lycophene has no vitamin A like activity. Retinol is an animal form of vitamin A and is essential for vision. in retinol,aren’t the alkyl substituent supposed to be four ? I can’t understand how i consider the ring residue for the cyclic alkene system by using woodward fieser rule. I calculated Beta- Carotene value as 434 nm. I am happy after seeing above article to know about lambda max value…good job..
Great presentation, and very useful thank you. I was trying to calculate the lamba max for astaxanthin (an analogue of beta carotene). I calculated it to 447.7 nm but i was wondering if the endocyclic carbonyls at the terminal ends of the conjugation would have any alternative effects? Firstly, the Fieser-Kuhn rules were not developed for carbonyls. Furthermore, in astaxanthin, the carbonyls are actually counted as exocyclic double bonds as they are outside of the ring. Your calculation does come close though to the observed lambda max of 478 nm. However, the rules do not specify anything for carbonyls. If you do find something, please do share it on this page. Thanks. Great stuff! Can you combine the two equations for retinoic acids? Thanks Denis. Not sure if we can combine equations for retinoic acids. we have added retinol as sample no. 3 as per your request.